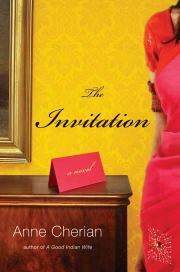 This month Suprose will be giving away 3 copies of Anne Cherian's The Invitation. The Suprose interview with Anne Cherian is here. You can read a review of the book -- from Kirkus Reviews. Want to win one of 3 copies of The Invitation? Please leave both your name and email in the comments section by midnight EST on Thursday May 31st. Three people will be randomly selected on Thursday May 31st to win a copy of the book. You will be contacted via email. Remember to leave your name and email. The deadline is Thursday May 31st. So long as it's okay to keep entering here I am again (if it's not I'm sorry, just let me know). I really liked what Anne Cherian said in her interview about her novels being character driven and yet needing to keep things moving, that's something I struggle with in my own writing and I look forward to seeing how she handles it. Yes Sara. You can enter every month. Can't wait for the new book! The Good Indian Wife was an awesome read and I am so excited about The Invitation. Liked the interview. Would love to get a copy!